If we will compute the duration of this cycle for me, 3 months from product request to farming, 5 months from farming to harvest, it was a total of 8 months. I received my contract on 27 July 2018, returned it signed the next day. The start of farming was 01 October 2018 and got my profit on 28 March 2019. 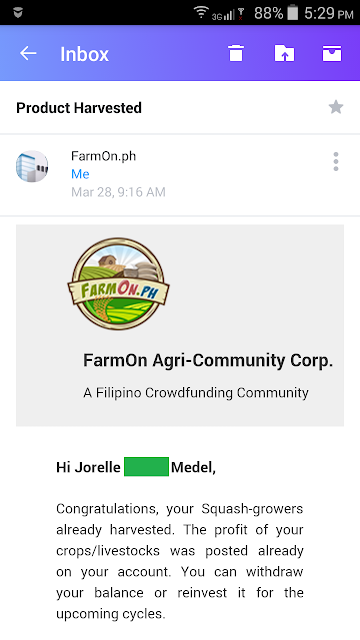 If I will still be able to invest for short-term crops for FarmOn 1.0, I would still choose it than the 2.0 because it only takes 8 months for a 12.9% return compared to the proposed ROI of FarmOn 2.0 which takes a whole year for a 10% return (I chose the lowest ROI in their table, 10%, 15% and 20%). But since the last 2 cycles (20th and 21st), I haven't been able to invest for short-term crops. Considering they've only been offering Rice for the past 2 cycles, which takes 6-8 months to harvest plus the registration and posting of investment which takes 3 months, I think I will try out the 2.0 version and invest for technology. Or maybe I'll try to split my funds between 1.0 and 2.0 and review after a year or so which of it yields best for me. And before this gets published, dininig tayo ng langit! FarmOn just announced on 12 April that the 22nd Cycle will be open for registration on 22 April 2019. And! There will be Squash (Growers) and Watermelon (Growers)!! !